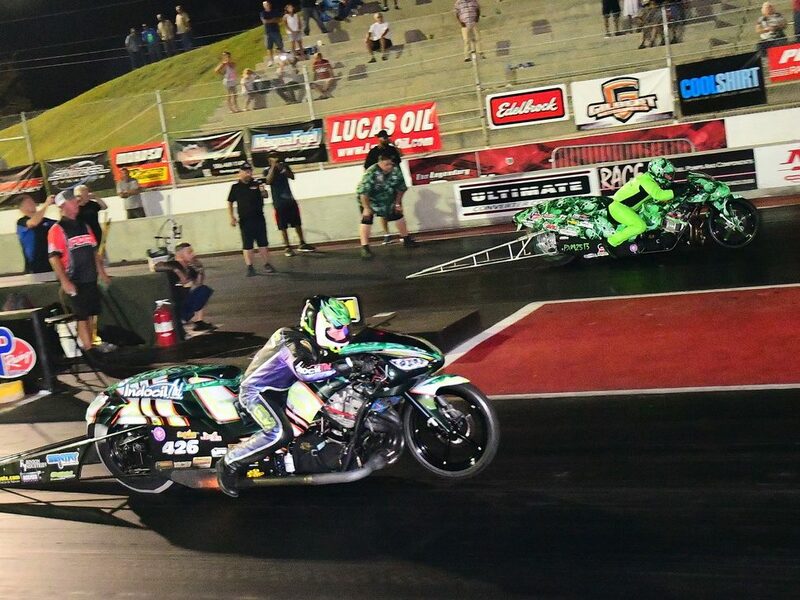 Winless in PDRA Pro Extreme Motorcycle since late 2016, Brunson Grothus was eager to fight through an ultra-competitive field of motorcycles to earn the Fall Nationals victory. His 4.016 at 175.99 on his Indocil Art ’15 Suzuki defeated first-time finalist Spencer Allen’s 4.082 at 174.55. No. 1 qualifier Terry Schweigert backed up his record-setting 3.914 at 184.58 from Friday night with his second-round pass of 3.942 at 181.09 aboard a new turbocharged entry, though the Canadian dairy farmer left the starting line too soon. Grothus qualified No. 2 with a career-best 3.998 and raced past points leader Ronnie “Pro Mod” Smith and defending world champion Travis Davis before taking advantage of a semifinal bye run. Allen rode his Lamination Station Racing Suzuki to round wins over Ricardo Knights, Chris Garner-Jones and Ehren Litten.